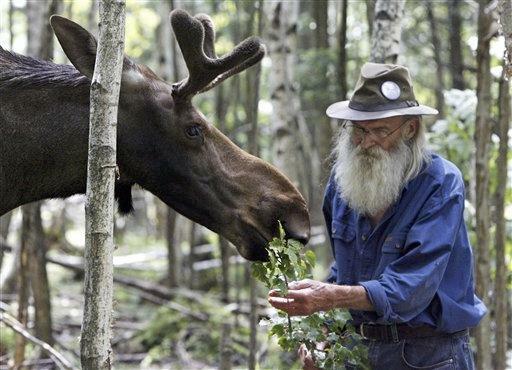 MONTPELIER, Vt. (AP) - Pete the Moose's pardon may be short-lived after all, now that state lawmakers are being urged to reconsider it. Or he may just have to find a new home. The 700-pound moose became a cause celebre last year after Vermont wildlife officials said he may have to be euthanized to avoid the spread of disease from a northern Vermont game preserve where he lives. In an eleventh-hour compromise by the Vermont Legislature, Big Rack Ridge owner Doug Nelson was allowed in May to keep the deer, moose and elk on his fenced-in 700-acre captive hunting facility by a measure that designed them a "special purpose herd" and gave him ownership of the animals. The turnabout came after the moose's plight inspired a "Save Pete the Moose" website, a Facebook page with thousands of fans, some 10,000 YouTube views and a Statehouse rally. Now, lawmakers are poised to repeal the earlier measure, under pressure from hunters and wildlife officials who say giving Nelson ownership was a dangerous precedent that violates the idea that wild animals are part of a public trust and can't be owned by an individual. "... It was a terrible mistake made last year in giving private ownership of native wildlife to an individual," said Patrick Berry, commissioner of the state Department of Fish and Wildlife. He called it "Russian roulette" to allow the preserve, which charges hunters to kill trophy elk, to continue to function, with native species like white-tailed deer and moose mixing with imported elk and their feed, which could carry chronic wasting disease. The disease has not been found in Vermont, but critics of the game preserve say its porous fencing allows animals to come and go or have contact through it, potentially spreading disease. Under a bill now being considered, the special designation would be repealed and Nelson ordered to remove the deer and moose, either by controlled hunts or by relocating them. State Rep. David Deen, who sponsored it, says some of the animals would be hunted and others moved to wildlife facilities or petting farms. The specifics would be worked out between Nelson and state wildlife officials, said Deen, D-Westminster. Soft-spoken but defiant, Nelson appeared before a legislative committee Tuesday, saying he tests his animals for disease and that he's invested millions in the facility, which charges hunters $250 to take a deer and up to $12,500 to take a bull elk but doesn't allow the moose to be hunted. Nelson said he opposes the bill's provision transferring jurisdiction over the preserve from the state Agency of Agriculture to the state Department of Fish and Wildlife. "If it goes to back to Fish and Wildlife, I think they're going to want to come in there and shoot the fawns and shoot the moose calves. And by God, they might have to shoot me," he said. If the state forces him to move the deer and moose, Nelson said he would close the rugged, thickly forested preserve and turn it into cornfields. Many see the furor over Pete the Moose as a red herring, that the more serious issue of Vermont's crackdown on Big Rack Ridge was lost in the emotional rush to save the moose. Part of the problem, says one lawmaker, was that he got named in the first place. "Can we amend this to say you can't name animals?" said state Rep. Dustin Degree, R-Franklin. "If he wasn't named Pete and he was just a random moose, we wouldn't be here."